So, what was so special about TD? A number of things, including album artwork (Monique Froese’s gorgeous photographs and paintings for the covers and centrefolds) and a commitment to live touring (I think I caught three consecutive tours in three years, and remember them being long-form semi-improvisations with little studio material). But for me it was a combination of technology and process. It goes without saying that the technology is useless without artistic intent, creativity and the ability to deliver. This is where TD excelled through a process which led them to constantly refresh their arsenal of keyboards and sequencers, and push each system to its technical limits in pursuit of their art. The first time I heard a polyphonic synthesiser (as opposed to organ or string machine) was on Cyclone; the first sequence pattern longer than 100 notes on Pinnacles; and Exit really is the definitive showcase work for PPG Wave. And every work was pushing boundaries, riding each technological wave in search of an artistic vision. To be fair, TD’s output could be a bit hit-or-miss: their early-80s movie soundtracks were, by and large, nondescript (Sorcerer and, to a lesser extent, Legend being notable exceptions), and the occasional improvised live set would not quite make it off the ground, but the “Virgin-years” studio albums (Phaedra to Hyperborea, inclusive) are pretty consistently excellent, as are Froese’s solo albums from the same period (Macula Transfer still strikes me as delightfully introspective and considered, while Stuntman‘s sound design and sequencer programming are still breathtaking). If pressed to nominate one TD album above all others, it would have to be Tangram: a gorgeous combination of sonic painting, crafted synth polyrhythms and slick melodic lines. It’s a wonderful escape and an absolute joy. Tangerine Dream pretty much single-handedly gave birth to the genre referred to these days as “Berlin School“, a classification which, in my opinion, totally misses the point. 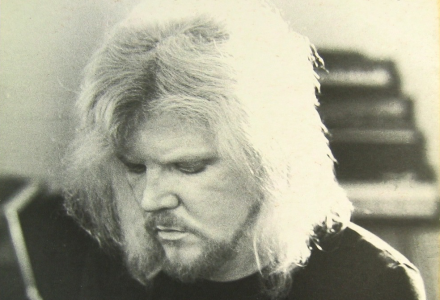 Edgar Froese had a particular artistic furrow to plough, and chose to do it by investing heavily in contemporary technological resources and skills (which is why TD’s most successful period was with Chris Franke programming sequencers to a level of skill and finesse possibly unequalled today). Berlin School is a photo snapshot of that process in the technology of the time. Today the pioneers are elsewhere.